Vemulaghat residents are unhappy with the ruling TRS saying that it has not done them justice in the Mallannasagar project, which will submerge their village. The otherwise quiet village of Vemulaghat in Telangana’s Siddipet district was abuzz with political discussion on Sunday evening as news just reached the local WhatsApp group that ex-Congress state minister Cheruku Muthyam Reddy had defected to the ruling Telangana Rashtra Samithi (TRS). Reddy joined TRS in the presence of caretaker Irrigation Minister T Harish Rao after he was disappointed at not being given a ticket. “Did you see? Did you see? There’s a photo,” says a young man as he arrives at a large tent set up outside the gram panchayat, passing his phone around for the older people already assembled there to take a look. A collective sense of disappointment is apparent among those gathered. “We were planning to vote for him. If the Congress would have fielded him, the Dubbak seat would’ve definitely been theirs. Now, we won’t vote for him because he has jumped to the TRS,” one local explains. Vemulaghat falls under the Dubbak constituency in Siddipet district, which is considered a TRS stronghold. A loss for the TRS here would be seen as a loss of prestige. But Vemulaghat locals have taken a vow not to vote for the TRS as they say that the party has not listened to their problems. The village is being seen as a thorn in the side of the ruling party that hopes to return to power. “Very few from our mandal itself will vote for TRS because many have been deceived by the Mallannasagar project. While they may get some stray votes, the majority of the people are against the party,” says another local. The locals of Vemulaghat have been on a non-violent protest for close to 900 days, after they took a united decision to not give up their land for the construction of the Mallannasagar reservoir, a pet scheme of the Telangana government. Every day for the last 898 days, five people have assembled at the centre of the village outside the gram panchayat and taken part in a relay hunger strike. Right opposite the protest site, a statue of Mahatma Gandhi overlooks those who sit on strike every day. The Mallannasagar project aims to divert water to drought-hit regions of the state, but will submerge several villages in the process, including Vemulaghat. The locals have only one demand – they will give up their land under the Land Acquisition Act of 2013, and not under Government Orders (GOs) that the state has issued. In fact, the locals have also moved the court and managed to get a stay on the GOs that were issued. Locals say that their protest is not associated with political parties in power but is related to their demand. “It is irrelevant to us as to which party forms the government. Those who had given up their land under GO 123 are yet to get compensation from the state government. Many of them were fooled, and are still awaiting a 2BHK house in return for their land,” explains Hayatuddin, another local. “It is not enough to just give us compensation. We are farmers and we have known only agriculture our entire lives. What we are demanding is adequate compensation that includes an alternate means of livelihood or land, so that we can continue doing something once we are evicted,” he adds. Hayatuddin, also a lawyer, says that they have filed 105 cases in the Hyderabad High Court and with the National Green Tribunal (NGT) related to the Kaleshwaram project, out of which 59 are related to Vemulaghat. “However, the state has not filed counters in many cases,” he adds. 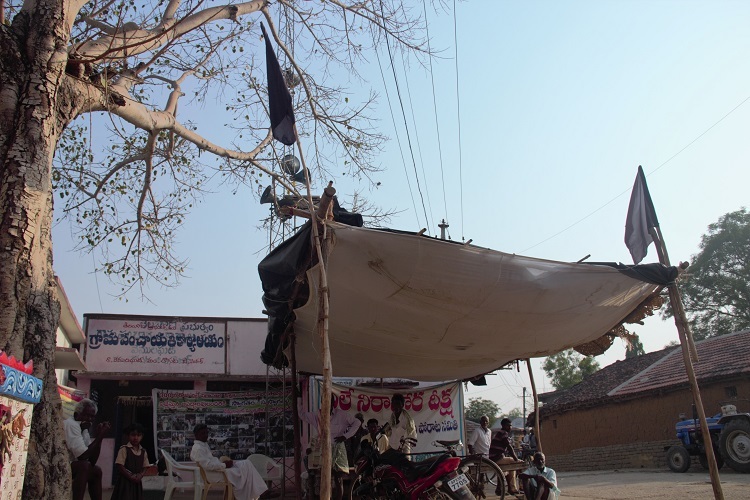 The village was also a hotbed of the Telangana separate statehood agitation. Most locals say that they participated in the movement and were staunch TRS supporters at one time. “No one here is saying that we won’t give up our land. We are more than willing to do so in the larger interests of the state, but only if all legal procedures are followed,” says Srinivas Reddy, a local leader. The locals also say that even if the Mahakutami comes to power, their protest will continue until their demands are met. The TRS has fielded Solipeta Ramalinga Reddy, a local strongman who is confident of his win, at Dubbak while Cheruku Muthyam Reddy, who had been working on the ground for a long time, including with the locals of the village, was hoping for a Congress ticket. However, the Congress-led grand alliance or ‘Mahakutami’, which includes the Telangana Jana Samithi (TJS), the Telugu Desam Party (TDP) and the CPI, granted the Dubbak seat to the TJS. The TJS has fielded Chindam Raj Kumar, the party’s constituency in-charge, but locals in Vemulaghat say that they have never even seen him. “There are two problems that arise now. One is that the Congress candidate is more well-known and no one knows the TJS candidate. The other is that the older people in the village only know the ‘Hand’ symbol associated with the Congress. Many may get confused when they see the matchbox symbol allotted to the TJS,” explains Malla Reddy, a resident of the village.